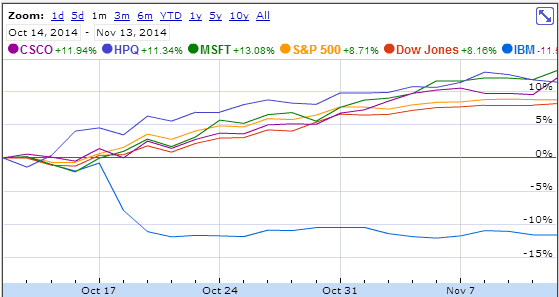 Did Apple & IBM know which analysts could trash share prices? Do you? You probably don’t know all the investor-savvy analysts pushing down tech share prices. Apple’s shocking $40bn share price fall in through September and mid-October wasn’t simply about actors’ privacy. And the $20bn wiped off IBM’s share price on October 18 wasn’t just about sluggish sales. These are the series in a number of tech firms that have suffered major financial blows in the last six months, including most of 2012’s major IPOs. The impact can be lasting: IBM’s value is down 10 percent since October 17, while both the market as a whole, reflected by the Dow and S&P 500, and competitors like Microsoft, HP and Cisco are all up by more than 7 percent. We think most other AR teams are flying blind. Sadly CFO’s don’t have industry analysts on their radar. Expect more crashes. Sadly, few influencer relations professionals know which analysts influence analysts, or how spokespeople can speak finance – rather than features – to them. As a result, the current slide in stock prices is exposing most exchange-listed tech and telecoms firms to a substantial repetitional danger with an associated financial risk that’s widely overlooked. Private firms are also missing out on the opportunity to influence analysts who are speaking to their potential investors, or the firms that represent them. Investors are moving from cautious to nervous. First funding rounds are increasingly hard for tech firms. There is more late round funding because IPOs are getting rarer. Box and other bellwethers are coming under increasing scrutiny. Friendly bankers are running to get to out, and offload to pension funds. In term that means there are more private buyers, buyers who use their own stock and rely more on industry analysts than banks do. Because start ups have useless multiples, investors are increasingly worried that their funds have nowhere to go if the market tumbles. Analysts are central to that. While investment banks have always used analysts, and many analyst firms are rooted in supplying insight to investors, our Analyst Value Survey shows a remarkable shift. The freemium and vendor-sponsored model couples with analysts’ growing media profile (both social and earned) to multiply analysts’ impact on investors. Central to Apple’s fall was Gartner’s statement downplaying the market for tablets just as the new iPads were launched. This shows a new context: AR is increasingly for sales of distressed companies rather than of solutions. Analysts are now also being asked: who could investors sell their holdings in tech firms to, or who can they buy? Over the last month Kea Company has been sending clients their 2014 drill-down reports, based on our Analyst Value Survey data. These reports show which analyst firms are most influential on investors according to professionals in your industry, region and market segment. To find out more, contact us.